With this all-inclusive kit, play "pumpkin roulette" with a seed mix of orange, white, or blue pumpkins. Pumpkins are the new pumpkin lattes. Plant your own and play "pumpkin roulette" with a mix of seeds that grow into classic orange, white, and/or blue pumpkins. Start indoors by placing the growing medium into the nutrient-rich, biodegradable pot, and planting the organic seeds—all included in the kit. When the seedlings are ready, dig a small hole in your garden and drop the whole pot inside. The roots will push right through it. All you have to do is water it and watch as the vine sprouts leaves, flowers, and and itty bitty baby pumpkins that grow up before your eyes. Made in Illinois. Prior to launching their company, Sarah and Nick struggled to sustain a kitchen garden in their fourth-floor Chicago apartment. Despite both honing their gardening skills as children, as busy adults they struggled to grow anything (container gardening is incredibly challenging). They turned to hydroponics for help and were astounded by the results, but unimpressed with the quality of products available. With that, the seed for their stylish, space-saving indoor gardens was planted. Plant your seeds in the included biodegradable cow pot. Once grown, you can replant the entire pot outside. Tender, young roots will easily penetrate the sides and bottoms of the pot, growing freely once transplanted. 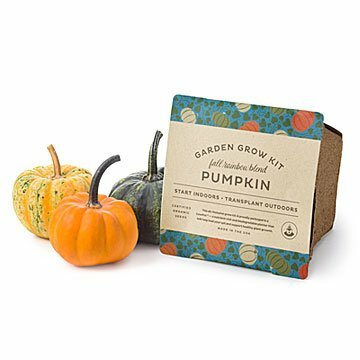 Fun product to enjoy and see what grows! I am giving this to my daughter who is an avid gardener and especially loves to grow pumpkins. It is right up her alley and I can't wait to hear what she says when she opens it.